PACIFIC YELLOWFIN Yacht Charter - Main Salon. Country Kitchen in the far end. PACIFIC YELLOWFIN Yacht Charter - Aft Deck Dining for 10. This area can be fully enclosed. PACIFIC YELLOWFIN Yacht Charter - BEARS CABIN. Additional upper/lower single beds not shown. PACIFIC YELLOWFIN Yacht Charter - ORCAS CABIN. Additional drop down single bed not shown. Ideal for 8 guests in 4 staterooms. 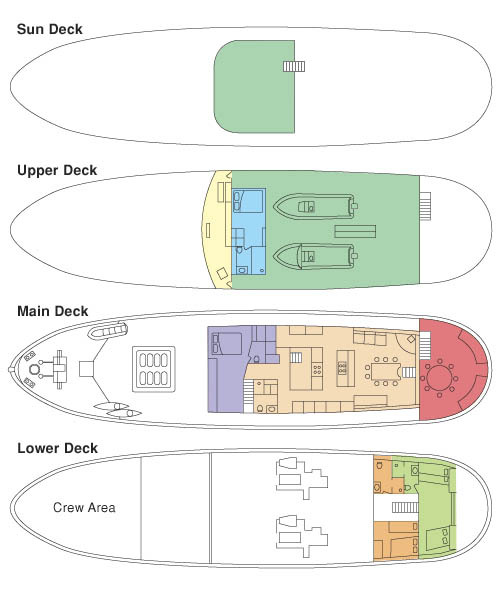 - 4 staterooms. 3 with ensuite bathroom, 1 with bathroom across the hall. All with DVDs on Flat Screen TV. - 2 couches in main salon, with full powder room bathroom with shower. - 2 in seating area on the aft deck. Sleeps 3. QUEEN bed. Couch that becomes SINGLE bed (not shown in layout diagram or photos). Five opening portholes. Door to the outside deck. Private ensuite bathroom with shower. DVD. Sleeps 2. QUEEN bed. View windows. Private ensuite bathroom with bathtub/shower. DVD. Sleeps 4. QUEEN bed on one side. 2 SINGLE offset upper/lower beds on the other side. Private ensuite bathroom with shower. DVD. Sleeps 3. DOUBLE bed on one side. Drop down Pullman SINGLE bed on the other side. Two opening portholes. Private bathroom is across the hall, with shower. DVD. Main Salon dining seats 8. Aft deck dining seats 10. Communicate: Cell phone. Cell based internet. Wi-fi internet in some locations. Impeccable service and generosity are what best describes our crew, who endeavor to go above & beyond our guests’ wishes. Their knowledge of the coast, experience on the water and incredible personalities are great assets of the journey aboard Pacific Yellowfin. However, though always keen on sharing travel anecdotes or out of the ordinary happenings, they know when to vanish and let guests relax, enjoy themselves and make the most of these magnificent landscapes. Meet Ben, our charismatic Red Seal Chef, Sommelier and local Island boy. Growing up on Salt Spring Island on the coast of BC, Ben has always been surrounded by the ocean, farms and amazing wildlife. These three things have influenced all aspects of his life, from becoming a Chef to traveling the world. Having spent over 10 years in the restaurant and catering businesses, Ben has found his niche at the Pacific Yellowfin and is finally able to indulge of his, local, farm-to-table passions.